Edvard Munch: Psyche, Symbol and Expression will present 83 outstanding examples of Munch's prints and paintings from private collections and leading museums in the United States and Norway.This exhibition takes an innovative and interdisciplinary approach to the study of the style, subject matter, and interpretations of the art of Edvard Munch in modern European culture. Scholars from a variety of disciplines will explore the meanings of Munch's imagery, his sources in Symbolist art and his legacy for German Expressionism in the context of contemporaneous developments in psychology, literature, and philosophy. 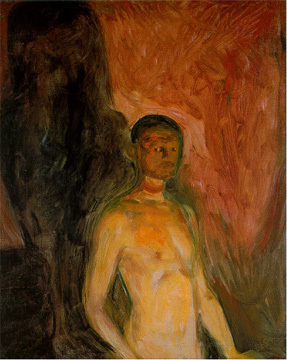 Edvard Munch is a unique figure in the history of modern art: he was the first Scandinavian visual artist to earn an international reputation in the explosion of creativity in the late 19th and early 20th century known as the "Scandinavian Renaissance." His haunting painting The Scream (1893) has become an iconic image of anxiety in the modern world and has made him one of the most recognized artists in the world. Yet there is much more to Munch's art than this single melodramatic note. He was a highly productive artist who worked for more than six decades, becoming a major portraitist and landscape artist, as well as perhaps the most searching explorer of human passions, including universal themes of love, death and spiritual seeking. In the aftermath of Impressionism, Munch, along with the Dutch Vincent Van Gogh and the French Paul Gauguin, was one of the most important artists to make his personal emotions and spiritual longings the focus of his art. A deeply ambitious artist, he sought no less than to express the fundamental themes of life in the modern world as it was actually lived, and to portray them in an authentic, powerful style which laid the groundwork for modern Expressionism. Previous treatments of Munch have not often recognized the religious significance of Munch's works, but he himself insisted that "In all my work people will see that I am a doubter, but I never deny or mock religion." Far from mocking religious values, even controversial works such as his Madonna of 1895 are sincere representations of his personal attempt to understand the sacred quality of life and the fundamental mystery of existence. Edvard Munch: Psyche, Spirit and Expression is curated by Professor Jeffery Howe (Fine Arts) with Professors Claude Cernuschi (Fine Arts), Scott T. Cummings (Theater), Katherine Nahum (Fine Arts), Vanessa Rumble (Philosophy) and Stephen Scloesser, SJ (History). The exhibition is organized by the McMullen Museum of Art and underwritten by Boston College and the Patrons of the McMullen Museum with an indemnity from the Federal Council on the Arts and Humanities. Additional support has been provided by Per Arneberg and the Andrew E. and G. Norman Wigeland Fund of the American-Scandinavian Foundation. Scandinavian Airlines System provided assistance with transportation.